Upon our most recent trip to South Africa we had the pleasure of travelling through two small Free State towns known as Warden and Harrismith, situated alongside the N3 highway. It was when we traveled through Harrismith that we noticed the most beautiful peaks and hills alongside a flat mountaintop. This mountain, known as Platberg, overlooks the town of Harrismith and strongly reminds one of Table Mountain in Cape Town due to its beautiful flat-topped plateau stretching well over 9 km. It is rare gems like these which make traveling around South Africa so exhilarating. Sometime later I found that the locals, indeed, consider Platberg to be “Table Mountain of the Free State Province,” as it is so similar to Table Mountain. Platberg Mountain is a natural continuation of the Drakensberg Mountains and is known for its nature reserve (Platberg Reserve), which has a unique range of biodiversity. This mountain is an inselberg formation, which is defined as a single hill that projects abruptly from a level plain – in simple words, a solitary hill. There is a wide variety of wildlife to be found in the area of Platberg Mountain, such as the eland, black wildebeest, blesbok and mountain reedbuck. The region also has several plantations of alpine timber, like Eucalyptus and Wattle. Due to the pleasant weather of the Free State, the Platberg mountain region is a popular destination for bikers, mountain bikers, photographers, hikers and wildlife enthusiasts. The area in and around Platberg has its own independent ecosystem. The soil is highly absorbent to rainwater, which runs in from the sheer cliffs and kloofs in the form of streams and waterfalls. Wild animals, such as eland, blesbok, mountain reedbuck, waterbuck and fallow deer, are found in abundance, and the area is today designated as a nature reserve or game reserve, known as the Platberg Reserve. There is a botanical garden known as the Drakensberg Botanical Garden, but today it is abandoned. The other name for this garden is the Harrismith Wildflower Garden and, although abandoned, it is still worth a visit, as a vast variety of flora are to be seen there, as well as several species of birds. There is no special story attached to the name of this mountain; it is simply the Afrikaans words for ‘flat mountain’ (‘plat’ and ‘berg’). Platberg Mountain is an inselberg (literally “island mountain”), which means that it is a single, stand-alone mountain in the middle of a plain. The outer layer of the mountain is made of Jurassic dolerite and lava and the lower layers are formed from the Karoo Supergroup, part of the Drakensberg Formation, which is the youngest part of the Stormberg Group. The summit is made of igneous rock, which is a combination of amygdaloidal basaltic lava and dolerite. The soil layer is shallow, extending to a depth of 10 mm to 200 mm, situated on sheets of rocks or ridges. Some parts of the soil in the wetland area in the lower reaches, however, form layers from 300 mm to 500 mm thick. The composition of the soil is a mix of fine sand, clay and silt, with a moderate to high proportion of organic matter. Climbing or hiking is no rocket science. Platberg Mountain is not exceptionally high, nor are there any really steep and treacherous rock faces, so complicated mountaineering equipment is not required. However, you might need a guide to reach the top, since there are areas where the cliffs are almost vertical at the top. A guide can show you the easiest route. 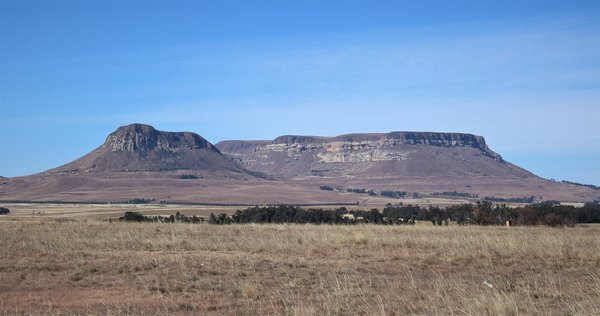 The topography in the Free State is generally understood to be flat, but the area around Platberg Mountain is far from it. This assumption leads to an underestimation while planning to climb the mountain or hike in the area around it. Robust shoes, clothing and basic props like sticks and emergency supplies are essential. The route to the summit starts gradually but gets steeper and more challenging as you cross the foot of the mountain. Donkey Pass Hiking Trail : This is the only trail, really, which takes you to the summit of the mountain. The trail starts gradually, then gets steeper as you approach the summit. Wild Horses Lodge – Located on the foothills of the Drakensberg and in the Sterkfontein Nature Reserve, this is an excellent place to set up, as Platberg Mountain is within walking distance or a short road trip. Self-Catering Accommodation – There are several of these establishments in Harrismith, in the form of chalets, flats, apartments, suites and villas which are self-contained and equipped with modern amenities. Hotels – Harrismith has several hotels, from basic to deluxe to suit every requirement, where you can enjoy various facilities like swimming pools, business centers, health spas and more. Guest Farms – This form of accommodation is quickly catching on in Harrismith nowadays, where you get to stay in a farmhouse amidst all the rustic features of farm life, but you still get comfortable accommodation and the food is usually highly palatable. Far accommodation is highly recommended if you wish to experience the local culture, since most of the Free State consists of agricultural land. Hiking Accessories – You don’t need any complicated mountaineering equipment, but you would be well-advised to carry a map (and/or GPS/Mobile Phone – a paper map will be handy if your battery runs out before you return! ), compass and a first-aid kit. Wear warm clothing in winter and rainwear during rainy weather. Shoes – Robust climbing boots are needed because, although Platberg Mountain is not that high, the route to the summit is rugged and can be telling on the feet. Water – Do not underestimate your need for water, even in cooler weather. You never know when you may get stuck and will need more water than you had planned for, so plan to carry a bit more water than your exact estimate for the duration of the trip. Hiking Gear – The first important thing that you need to consider is a rucksack. It would be a good idea to make a list of the hiking gear that you plan to take and then buy a rucksack that is able to accommodate everything. There is no skiing in this area. However, winters are cold and the minimum temperature on Platberg Mountain can be as low as -2°C. There are instances of light snow during winter, but the snow layer isn’t sufficient to allow for skiing or other snow-related winter sports. The Legend of the Annual Mountain Race: In 1922, a British army major named Belcher humiliated the locals by calling Platberg Mountain “that little hill of yours”. In continuation of his jest, he challenged a soldier to a race to the summit. To his credit, the major won the race and the rest, as the adage goes, is history. Today, almost 100 years later, the legend continues with the annual mountain race which is held as part of the Berg Bohaai festival held during the month of October each year. This foot race is a grueling 15 km to the summit of Platberg mountain and it has become somewhat of a family tradition amongst the locals. The Legend of the Frozen Hitchhiker and the Angry Ostrich : On a cold winter morning in 1992, accomplished athlete and South African Cross-Country team captain, Annalie Gildenhuys, commenced a training run along the base of Platberg Mountain. After running for a while, she noticed a large, aggressive-looking ostrich looking at her. As she observed the bird waving its wings at her, she realized that it was in the attack mode. Gildenhuys continued on her way, trying to get out of the path of the ostrich, but the bird pursued her and knocked her down with a clean kick from behind. Once she was down, she played ‘dead’ thinking that the bird would be put off but it did not relent and started to trample her. A couple of cracked ribs and a punctured lung made her realize, amidst all the blood, that she was ‘dead meat’ unless she did something quickly to defend herself. A series of karate-style kicks toppled the bird, whereon she managed to get hold of its neck and throttle the ostrich to death with her bare hands! Annalie Gildenhuys, already a celebrity, now became a legend to be etched into the history of Platberg Mountain. Accommodation is easily available in Harrismith and, considering the friendly locals, it’s a nice place to visit to relax for a day or two, away from the hustle and bustle of city life. To make the most of your trip to Platberg Mountain, install the below app to conveniently measure the height of peaks and mountains in the surrounding area.